A filter fabric is well known for its functionality and longevity. However, a filter fabric is known for its high temperature and chemical resistance. Flannel is plain or twill woven fabrics popular for its softness and coziness. The softness comes from a technique employed by the mills called “double brushing”. It may be classified as brushed fabric with soft fibers protruding on one or both the fabric surface.Originally, flannel was made of wool, but now it is made of cotton, wool or any other synthetic fiber. Flannel fabrics are ideal for suitings, shirting, jackets, bedspreads, and pajamas. Flat or Jersey Knit fabrics have visible flat vertical lines on the front and dominant horizontal ribs on the back of the fabric. The flat or jersey knit stitch is used frequently, it is fast, inexpensive, and can be varied to produce fancy patterned fabrics. A major disadvantage of regular flat knits is their tendency to “run” if a yarn is broken. The flat or jersey stitch can be varied by using different yarns or double-looped stitches of different lengths to make terry, velour, and plush fabrics. This stitch is also used in making nylon hosiery, men’s underwear, and t-shirts. Fleece is a type of weft insertion jersey. Weft insertion fabrics are weft knitted fabrics in which an additional yarn is inserted for each course. These additional yarns are not knit, rather they are held by the loops in each course of the fabric. The inserted yarn may be decorative or functional like stretch yarn. It provides stability, cover, and comfort. The insertion yarn is usually coarser than the base yarn. When the insertion yarn forming piles are sheared and napped, it is called Fleece. They are usually made of Cotton, Cotton/Polyester, Wool, and Acrylic. End Uses include jackets, dresses, sportswear, and sweaters. Foulard Fabrics are lightweight twill weave plain fabrics with distinctive soft finish originally used to made from silk or silk-blends. The fabric is often characterized by a small printed design of various colors. Fustian is a heavyweight fabric made with a linen warp and cotton wefts or fillings. The Fustian fabrics are usually used for menswear and the name “Fustian” is generally used to denote heavy fabrics in the past. Gabardine is made of twill woven worsted or cotton fabric. The fabric is produced by maintaining higher twist on warp yarns compared to weft yarns resulting in a fine, prominent twill line. The fabric is available in various surface designs like heather, stripes, checks, plaid, or solid color. Since the fabric is durable, gabardine is widely used in making pants, shirting and suiting. Gauze is plain weave fabrics constructed with more spaces between the threads than regular fabric. Gauze fabric is usually made of cotton, rayon or their blends of soft texture spun yarns. Though not suitable for durable applications, it is used in apparel, home furnishing like curtains and is popular in medical uses for bandages. Georgette is a sheer and strong silk or silk-like clothing fabric that often comes with a dull, creped surface. In simple words, it is a sheer lightweight fabric that provides utmost comfort. This is fabric is usually made out of silk or polyester. As compared to chiffon, it is opaque and slightly heavy. If it comes to least expensive and much practical fabric. Due to its exquisiteness and uniqueness, a georgette fabric proves a demanding item in the fashion industry. Gingham is a medium weight plain-woven fabric made from dyed cotton or cotton blends. The word “Gingham” originated from the Malay word “Genggang” meaning “striped” and the fabrics are made with checks as the name suggests. does not refers to the color of the fabric. It implies that no finishing treatment has been given to it. Grey fabrics are used chiefly when the aesthetic values of the end-products are limited. Due to its cost-effectiveness, exquisiteness, and longevity, the grey fabric has been widely used for cloth manufacturing. The uniquely woven grey fabric has become increasingly popular in appreciation of increased market demand. The industrial fabric is a fabric which is usually made from man-made fibers like fiberglass, carbon, and aramid fibers. It covers a wide variety of widths, weights and construction particularly made to meet a specific application. The industrial fabric is used for decorative purposes. The industrial fabric is woven in various thicknesses and constructions in a basic weave, namely plain, leno, satin, basket etc. It is primarily used for filtration, marine and recreational products, insulation, electronics, commercial & construction, and protective garments etc. Intarsia is patterned single knit fabric. It is made of knitting multi-coloured yarns. The fabric has the same course knitted in different colors with different yarns. It has colored designs as blocks distributed in different color backgrounds. The patterns look identical on both the face and backside of the fabric. There are no floats found on the backside of the fabric. 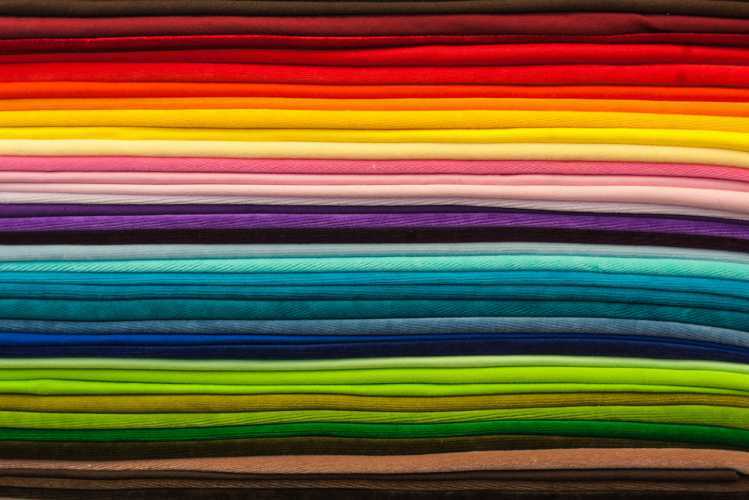 It is typically used to make shirts, blouses, and sweaters. Interlock stitch Knits are variations of rib stitch knits. The front and back of interlocks are the same. These fabrics are usually heavier and thicker than regular rib knit fabrics unless used with finer yarns. The interlocking of stitches prevents runs and produces apparel fabrics that do not ravel or curl at the edges. Combinations of yarn types in terms of color textures etc. Jacquard fabrics have different colored loops made of different threads in the same course. Floats are an inherent feature of single jersey jacquards. They are widely used in the sweater industry. Kashmir silk is a silk fabric produced in plain weave and is either embroidered or printed. The motifs used are characteristic of Kashmir. It is used for shirts, women’s wear and sarees. Kashmir shawls are woven in twill weave and are usually embroidered with traditional Kashmiri embroidery. Khadi is a term used for a wide variety of fabrics that are hand spun and hand woven. They are produced in mainly one cotton fibre, blends of two or more fibres. They are known for durability and simplicity. The fabrics can be suitings dhoties overalls and household textiles. Khaki is a lightweight, soft twill fabric often used for home decoration, jackets, skirts, and dresses. The light brown with a yellowish tinge, the Khaki fabric is often used for police and military uniforms and made with cotton, wool, or its blends. Lame is woven or knit Fabrics with thin ribbons of metallic fibers drapped around the primary yarn, usually with gold or silver metalic colored fibers, but copper colors are not rare either. The Lame fabrics are used often on party wears, or as costumes for theatrical and dance costumes. Sometimes the apparels, bags, beds are needed to be protected from the dust and other outer particles. This can be carried out through the laminated fabric, used to laminate all kind of clothing, sheets, covers, handbags and many more. Laminated fabric safeguards the core thing from any kind of external particles that hampers the quality and the glaze. Lamination is carried us by the covering the material with the protective film on all the sides. That does not let water to pass through, making the material completely safe. However, it is not completely airtight as moisture is allowed to let in the for the long life of the fabrics. Laminated fabric adds the durability and sustains the quality. In the recent developments, laminated fabric designs and shapes have been transformed with the undue assistance of the modern tools and techniques. Also, people have shown a great deal of zeal in the laminate fabrics because of it. Lawn Fabrics are popularly known as “handkerchief linen” are plain weave cloths originally used to made with flax/linen now are mostly made with cotton. Lawn is characterized with a fine, high-thread-count yarns, which results in a silky, untextured feel. A fabric in which an open effect is created by causing certain thread ends or doup threads to cross over. Two threads or ends act as one thread; when a weft thread passes between them, the doup ends twist catching the weft and holding it tightly in place. Very fancy and beautiful clothes can be produced by combining the cross weaving, with other weave structures. As the name suggests Linsey-Woolsey Fabrics are twill or plain coarse and roughly woven fabrics made with a Linen warp and Woollen weft. Madras Fabrics are lightweight cotton fabrics with generally patterned texture and plaid design, used primarily for summer clothing such as pants, shorts, dresses. Madras plaid fabrics are comprised of high quality, light-weight 100% cotton plaid designs that are available in many colors and plaid patterns. Madras net is used mainly for furnishing such as curtaining. The cloth is an open gauze ground cloth where an extra weft is inserted to produce a motif, this is then woven into the ground cloth. Where there is a surplus floating weft yarn this is then cut away after weaving revealing the motif, the edge of the sheared motif shows shorn ends of a weft yarn. A term used to denote very fine clear fabrics, finer than muslins. Made of silk, wool or cotton, the weave structure is either (plain) tabby or two and one twill. In the 18th century, the British term referred to a fine cloth with a cotton warp and a worsted weft. In France, from the late 18th century onwards mousseline-delaines were made of very fine wool which was printed in beautiful designs. This fabric proved very popular for fashionable as dress and shawl fabrics. The mousseline cloth is so fine and transparent it is often found backed with another cloth of either a satin or taffeta silk. Muslin is a lightweight open cloth of plain weave. It may be used as grey or bleached and dyed. It is used as household textiles and dress materials. The name is derived from the city of Mosul where the fabric was first made. It is a very light and open tabby (plain) weave fabric used for summer dresses and utility use. At first, the cloth was not always plain but could also have silk and gold thread woven into it. As the ability to spin yarns of greater fineness developed cotton was used more readily than silk. In this muslin, the motif weaves in and out of the cloth, as if it has been embroidered. In the Madras net, the motif is predominately woven on the surface. Fabrics are something that we daily come across. With the clothing to the seats, the fabrics are an integral part of the lives. There are several sorts of fabrics like synthetic fabrics, natural fabrics and many more depending on their designs and usability. The narrow fabric is also the most commonly utilized fabrics in our daily lives. Laces: laces are used in shoes and many other tying purposes. Narrow fabrics in the laces make it strong and easy to grip on. In recent times, there has been a revolution in the designs and shapes of the laces composed of narrow fabric. Now, laces, like ropes are commonly used in the daily appliances. Tapes: narrow fabrics are used to make the tapes. These tapes are great in appearance and stiff in the quality. These tapes are used for wrapping, decorating and many other purposes. In the modern times, the usability of the narrow fabric has grown as it is light and has a splendid durability. That is why; narrow fabrics are hugely demanded in the global marketplace. Organdy is the sheerest and stiff cotton fabric made with fine spun combed yarns. The fabric is characterized by stiffness and crispness. The fabric is crisped, made transparent by applying a special process known as Parchmentzing. Most stiff varieties are used in home furnishing fabrics like curtains and softer Organdy varieties are used for summer wear like blouses, saris etc. Organza basically refers to a thin, plain weave, and a sheer fabric which is made out of continuous filament of silk yarns. Today, many Organzas are woven with synthetic filament fibers like nylon and polyester but most of the stylish organzas are woven in silk. The most popular item made of organza fabric are bags. Various designs and shapes of organza fabric bags are attracting people towards them. Adding a nice touch of sophistication and uniqueness Organza fabric is the choice of millions.